Many incorrect caresheets put out that commercial crab food is the only food that you can feed your crabs. They say it offers all of the nutrients that they need and is all that they could ever want. However, this could not be further from the truth. In fact, most commercial foods are no good for hermit crabs. They contain harmful preservatives and other ingredients that can be harmful to their small bodies. This brings up the subject of a natural diet. Wouldn't you want to ditch the stuff that could harm them and give them something that is healthy? The great thing about the natural diet is that hermit crabs can eat a variety of foods. Not only do you have to buy food for the crabs, but you can also harvest from outdoors! The foods that crabs can have are endless. The natural diet has many benefits. For starters, your crabs will have access to a wide variety of flavors and nutrients. They will respond differently to each food and you will enjoy watching them eat from what you just prepared. CALCIUM - the nutrient that builds strong bones. In crabs, calcium builds a strong exoskeleton. Calcium can be found in dark, leafy greens, milk and cheese (organic varieties), oyster shell, cuttlebone, egg shell, broccoli heads, and exoskeleton. When to Feed? 4-5 times a week. PROTEIN - the nutrient that builds muscles. In crabs, protein is needed for day-to-day functions. Protein can be found in all meats, wheat germ, flax seed, eggs, seeds, and nuts. CARBOHYDRATES - the nutrients that give boosts of energy and supply the crabs with daily energy. Carbohydrates can be found in honey, breads, wheats, sugary fruits, molasses, and wheat germ. When to Feed? 2-3 times a week. ZEAXANTHIN - the nutrient that aids in coloration. Zeaxanthin can be found in foods like blueberries, raspberries, broccoli, dandelion greens, plums, and coconuts. When to Feed? 3-4 times a week. ASTAXANTHIN - the nutrient that helps in coloration a lot. Astaxanthin can be found in foods like red seaweeds, shrimp, krill, orange bell peppers, and dark-colored flowers. BETA CAROTENE - the nutrient that aids in orange and red color. Beta carotene can be found in carrots, red and orange bell peppers, sweet potato, yellow corn, and dark greens. TANNIN - the nutrient that aids in coloration and healthy body functions. Tannin is found in barks, roots, and leaves of crab-safe varieties. OMEGA FATS - the nutrient that aids in heart health and other body functions. Omega fats can be found in salmon skin, flax seed, purslane, wheat germ, coconut, olive oil (and other healthy oils), flower petals, and omega fat gel-packs. VITAMINS A, B, C, D, E (and others) - the nutrients that aid in healthy body systems all over. Vitamins A, B, C, D, E can be found in a variety of foods like oranges, apple, banana, kiwi, watermelon, coconut, strawberries, grape, canteloupe, honeydew, tomatoes, zucchini, celery leaf, leafy greens, and carrot. The key to offering many vitamins is to feed variety. When to Feed? 7 times a week. PHYTONUTRIENTS - the nutrients that aid in healthy bodies. Phytonutrients are found in a variety of foods like vitamins. Some foods that contain many phytonutrients are apple, banana, kiwi, watermelon, coconut, strawberries, grape, canteloupe, honeydew, zucchini, celery leaf, leafy greens, carrot, and flowers like calendula, hibiscus, lilac, crabapple blossom, roses, and sunflowers. There is a sub-group of nutrients that are known as "others". These are foods that do not fit into other groups. 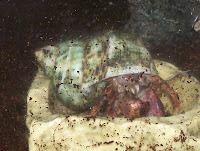 Vinegars (with the mother still attached) are known to be beneficial to hermit crabs. Some other foods in this group are vinegar, juices, teas (rooibos, hibiscus), sea salt, and beach sand. These should be fed 1 time per two weeks as they are not majorly important. After making sure you have each nutrient scheduled in for part of the day, you will want to keep in on your feedings. This will keep the crabs healthy and happy. 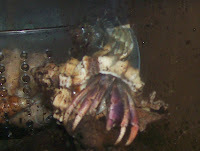 Molting should be a success and your crabs will live healthier.